The Mahavansha, also Mahawansha, (Pāli: «great chronicle») is a historical record, written in the Pāli language, of the Buddhist kings as well as Dravidian kings of Sri Lanka. It covers the period from the coming of King Vijaya in 543 BC to the reign of King Mahasena (334 – 361). The Mahavansha was written in the 6th century CE by the Buddhist monk Mahanama thero, brother of the Sri-Lankan King Dhatusena, and heavily relied on the Dipavansha, written five centuries earlier. A companion volume, the Choolavansha or Choolavansha («lesser chronicle»), compiled by Sinhala Buddhist monks, covers the period from the 4th century to the British takeover of Sri Lanka in 1815. The combined work, sometimes collectively referred to as the «Mahavansha», provides a continuous historical record of over two millennia. While not considered a canonical religious text, the Mahavansha is an important Buddhist document of the early history of religion in Sri Lanka, beginning near the time of the founder of Buddhism, Siddhartha Gautama. As it often refers to the royal dynasties of India, the Mahavansha is also valuable to historians who wish to date and relate contemporary royal dynasties in the Indian subcontinent. It is very important in dating the consecration of the Maurya emperor Asoka, which is related to the synchronicity with the Seleucids and Alexander the Great. 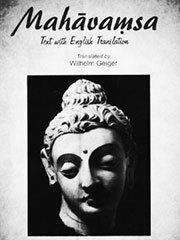 A German translation of Mahavansha was completed by Wilhelm Geiger in 1912. This was then translated into English by Mabel Haynes Bode, and the English translation was revised by Geiger. The revised English translation is now available on the World wide web.